Congress vice-president Rahul Gandhi last December said fruits and vegetables will become affordable if states allowed farmers to directly sell their produce to consumers. He also directed the chief ministers in Congress-ruled states to delist fruits and vegetables from the Agriculture Produce Marketing Committee (APMC) Act. 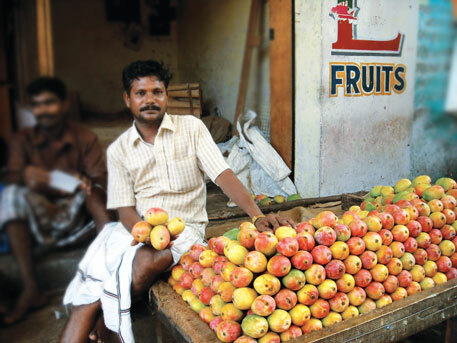 The Act makes it mandatory for farmers to sell their produce only to licensed merchants at mandis set up by state agriculture marketing boards. Rahul Gandhi said the delisting will eliminate these licensed merchants or middlemen who raise the prices for profits. Agriculture experts, however, believe the move will do more harm than good. A Congress leader says on an average five middlemen are involved between the farmer and the consumer. “The farmer sells his produce at a nominal price, but the merchants keep on adding their commissions. As a result, by the time it reaches the consumer, the prices are exorbitant,” he claims. On December 27 last year, Rahul Gandhi asked the 12 Congress-ruled states—Manipur, Mizoram, Assam, Karnataka, Andhra Pradesh, Haryana, Himachal Pradesh, Uttarakhand, Maharashtra, Arunachal Pradesh, Kerala and Mizoram—to issue notifications for delisting fruits and vegetables from the Act by January 15, 2014. While Uttarakhand, Assam, Arunachal Pradesh, Meghalaya and Haryana issued the notification before the deadline, the others are expected to do so shortly. A senior official with the agriculture ministry says the price of fruits and vegetables is unlikely to be affected since the decision of delisting is limited to the Congress-ruled states and is not adopted by major producers like Uttar Pradesh, Odisha, Gujarat and Punjab. Questions are also being raised on the practicality of the move because several states in the past have unsuccessfully tried to eliminate middlemen under different schemes. For example, in 1999, Andhra Pradesh’s rythu bazaar (farmer’s market) was started to provide a platform to farmers to sell their vegetables directly to consumers. The model could not eliminate middlemen. “Even in these bazaars, it is mostly the aggregators or agents who take farmer certificate and sells under their name. The fact is that a group of farmers generally finds somebody from the village and sell it to him and he gets a license to operate in this bazaar. So the deal for farmers even in rythu bazaar is the same,” says G V Ramajaneyulu of Centre for Sustainable Agriculture, a non-profit in Andhra Pradesh. Experts also fear the move will make the market chaotic. They say the primary objective of the APMC Act was to regularise the market for fruits and vegetables. In its absence, the agriculture marketing boards, which are responsible for the mandis, will not be able to monitor the quality of agricultural produce sold in the markets. 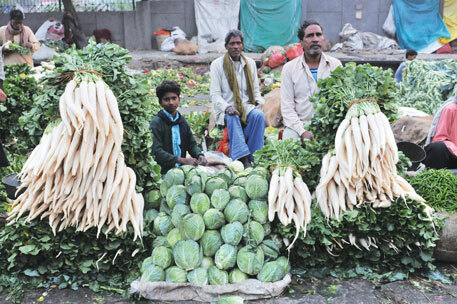 “Around 50-60 per cent of vegetables and fruits are routed through mandis. There are states like Punjab, Karnataka and Gujarat which have highly regulated mandis where over 70 per cent of vegetables and fruits are sold by the farmers because they have faith in the system,” says Singh. Experts and ministry officials unanimously believe that the Congress, instead of deregulating the market, should improve the APMC Act. In its recent report, government think tank Indian Council for Research and International Economic Relations claims 15 to 25 per cent of the total produce sold through the state mandis gets wasted due to multiple intermediaries and poor infrastructure. In this respect, the Centre had brought the model APMC Act, 2003, but the states did not show much interest. The 2003 Act called for public-private partnership in setting up of markets and recommended separate markets for fruits, vegetables and flowers. The move to delist fruits and vegetables from APMC Act will adversely affect both the state governments and farmers. The state governments will lose out on the revenue they get through the licence fees and mandi charges. Pranab Baruah, chief executive officer, Assam state agriculture marketing board, says, “The move is not going to affect Assam much because we don’t have big mandis like in other states such as Uttar Pradesh and Gujarat.” Sources in agriculture ministry say that Assam, which has freed 23 fruits and six vegetables from the trade regulation, will lose out on Rs 10 crore annually because of the move. They say Uttarakhand will lose out on Rs 8 crore and Haryana will lose out on Rs 40 crore every year due to the delisting. The argument seems valid when one considers that most of the farmers in the country are small with less than two hectares of farmland. As per government research body Indira Gandhi Institute of Development and Research, small farmers contribute around 70 per cent of the total production of vegetables and 55 per cent of fruits. Singh warns the decision to remove traders and merchants will increase the input cost for small farmers, who will now be responsible for the storage and transportation of their perishable produce. “Small farmers don’t have enough resources or quantity of produce that they would travel 20-30 km or more in a day to sell their produce. Also, with the free market, the farmers’ power to fight for prices will further diminish as he does not have enough produce to bargain,” says Ramajaneyulu. He suggests the state government should set up farmer cooperatives or producer companies. Industry bodies Federation of Indian Chambers of Commerce and Industry and Confederation of Indian Industry have been demanding removal of fruits and vegetables from the APMC Act for a long time. They believe the move will attract foreign direct investment in retail as many private players are willing to make huge investments in food supply chains. Singh says the move will also help domestic players who will not have to pay the licence fee to buy from the state-regulated mandis. The fee, which varies from state to state, is between four and six per cent of the cost of the produce procured from the mandis. “They are no more liable to pay anything. If you think, the move will encourage industry to have direct linkages with farmers, it’s not going to happen because they won’t invest in the infrastructure. Industry prefers to use the services of aggregators/merchants as it eases their procurement process,” he says. The handful of experts, that the story relied on, appears to be beating round the bush. The main problem is that APMC act in its original form is a derivative of the ECA 1951 and is primarily tuned to regulating the wholesale marketing cost. The model APMC act was introduced by NDA with an express approval of only eight states. Unfortunately UPA subsequently seconded it without really going into the basic issues. The experts seem to be shedding crocodile tears for revenue loss without taking a deep and incisive look at the balance sheets of APMCs. Of course we may raise the query how many APMCs make their Balance sheets available in the public domain or how many have declared dividend to the government. The five point formula of RaGa becomes meaningless under these circumstances. I do not agree with your analysis, which does not provide any facts, except statements of interested parties. We all know that APMC infrastructure (markets, licensed traders, etc) have all sucked the farmers. The farmers just do not get the prices, you are using fear psychosis that corporates would do hoarding. What happened under APMC, all of us know that traders managed to manipulate markets last Oct-Dec that in North India prices of vegetables skyrocketed to 5-6 times the normal rates. We need to find ways on how to have more players in the market, so that their is real competition among the buyers.